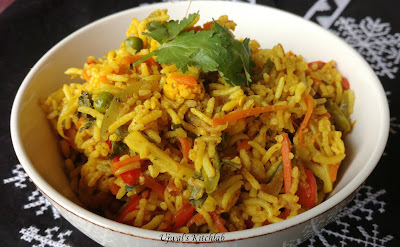 Tawa Pulao is a famous Mumbai street food. I have very fond memories of Mumbai trip.Few of my summer vacations and Ganesh Chaturthi holidays were spent in Mumbai with my cousins. Those were the best days of my life. I have fond memories of learning to skate, playing in the rains,cycling, cricket and lots more. My aunt would let us experiment to our hearts content in the kitchen. I think the freedom to experiment and appreciation towards the food by others has made me fond of cooking! This tawa pulao is usually made by the street side vendors using pav bhaji masala,butter,veggies and cooked rice. The pulao is mixed on huge tawa or griddle hence the Tawa Pulao. The veggies are cooked al dente keeping it crunchy and fresh. This has been a hit with my family and friends. Pair it up with some cool raita and enjoy a nice lunch/dinner. 1) Heat a big pot of water and cook rice with salt to taste until just cooked. Don't over cook. Drain and cool. 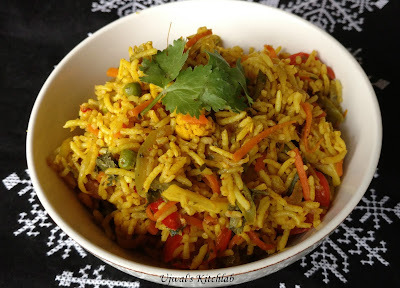 Refrigerated left over rice works well in this recipe. 2) In a wok add the butter or oil. Add the cumin seeds let it splutter before thorwing in the sliced onions. Cook on high . Add in the tomatoes and cook till mushy. Add the veggies and coloured peppers and saute on high until cooked but crunchy. 3) Add in all the masala powders and kasuri methi (Crushed between palms) and saute for a min. Add in the cooled rice and mix gently taking care not to break the rice. Add salt and little sugar to taste. Check for seasoning.Add spice powders if needed. When the rice is nicely and rice is evenly heated add the lemon juice and Mix well. Let it be on low flame for a few more mins. Switch off. Garnish with chopped coriander leaves.Serve with cool raita.